Windows 10 update feature or the Security And Update of older versions of Windows OS, automatically download the required updates. Basically, the updates are packed into files called KB or Knowledgebase. When you install any of the updates, you see the KBxxxxxx numbered file installed. If you want to update multiple Windows machines, downloading the same thing on all the machine takes time and waste precious bandwidth. You can manually download those knowledge base files from Microsoft update catalog server. 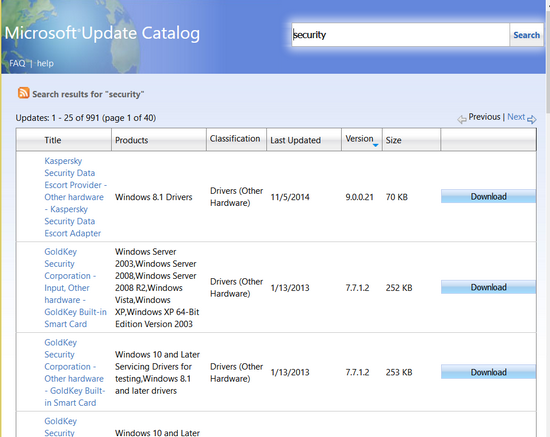 Head over to Microsoft Update Catalog website. Search for any specific KB file. Enter the correct number and hit search. You can search by the KB number, name of the specific update, the name of the operating system and then sort by date of update, size, and version number. You can download the appropriate file and then run it to install. If you want to download updates specific to drivers or you want to extract the drivers from Windows update, you can get more help about it on How to download updates that include drivers and hotfixes from the Windows Update Catalog. Learn more about the Microsoft Update catalog frequently asked questions. Transfer from Android to laptop, now laptop in bad shape, slow, doesn't pull anything up, etc. What is the exact problem? Can't understand what you said.